Now get most popular Hostpapa Business Hosting Plan at a special promotional price of $3.95 per month. This is a limited time offer and may be discontinued by the company any time. To get this Hostpapa discount deal, Click on the link below. Hostpapa is a 100% Green eco-friendly web hosting company with its origin in Canada. It has become popular as high-value, low-cost web host for small to medium sized businesses and bloggers. Host Papa offers solutions in Shared web hosting, VPS hosting and Reseller hosting space. Their feature rich hosting solutions include everything that a webmaster would require to build a great website. To top it, dedicated customer support, 99.9% uptime and high performance leave you with a good and satisfied feeling. To help you save extra on the already affordable Hostpapa pricing, we bring to you special Hostpapa Discounts and Promotions that the company has agreed to offer exclusively for visitors of intairnet.org. You can save up to 70% OFF on their most popular shared hosting plans by using our Hostpapa promo code. You are also entitled to a free domain name for first year of hosting subscription with this Hostpapa discount coupon. Here are the details. The entry level shared hosting “Starter Plan” is priced at $3.95/mo. Now they are offering the higher “Business Plan” (which is regularly priced at $12.99 per month) also at $3.95 per month for a limited time period. Also, you can register a new domain name for free as part of this offer. Below is the link to activate this deal. Just click on the button below to go to Hostpapa official website and activate the discounted pricing. If you use this link to purchase Hostpapa hosting, you will notice that $3.95/mo discount pricing is automatically applied and there is no need to enter any coupon code at the time of check-out. You may refer to our step-by-step instructions below to sign up with Hostpapa. Click on the “Claim Our Hostpapa Promo” button above or any other special link on this page. It will open hostpapa website and activate the promotional pricing in a new tab/page, so you can still follow these instructions. Click on the “GET STARTED” button to start the signup process. You will be taken to shared hosting plans and pricing page. There are 3 plans to choose from – Starter, Business and Business Pro. 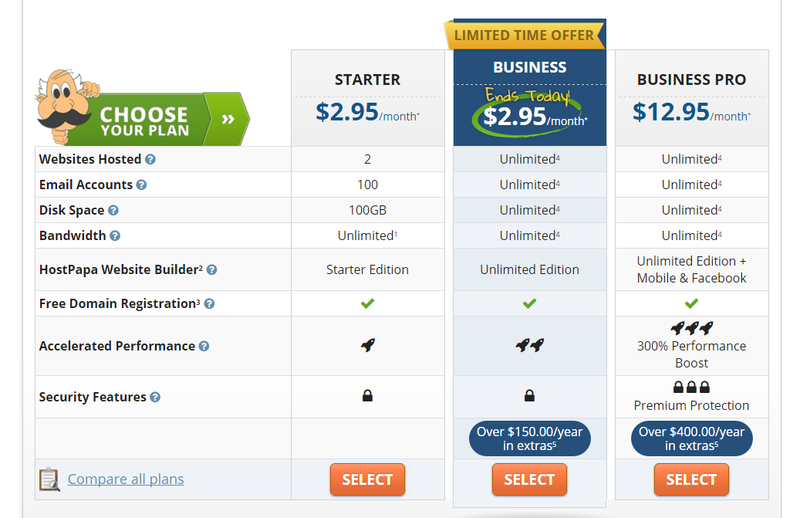 Business Plan is their most popular package with unlimited hosting features. Since it is now available at a heavy discount and costs the same as Starter Plan, we think that you should go with this plan, unless you are looking for high performance boost and premium security features in which case you should choose Business Pro plan. Click on the “SELECT” button under your choice of plan to move to next step. a. If you wish to register a new domain (remember Hostpapa offers one domain name registration free of cost for first year), enter name of the domain in the field provided on left side under “I need a domain name”. Click on “Check Availability” to proceed. b. If you wish to use a domain that you already own, enter it in the field on the right under “I already have a domain”. Then choose one of the two options – “Please transfer my domain to HostPapa” (choose this if you wish to transfer your domain from current registrar to Hostpapa) or “I will update my nameservers” (choose this if you do not want to change the registrar of the domain, and will just point the domain nameservers to Hostpapa servers). Click on “Continue” to proceed. On the next screen, make sure that your hosting plan of choice is selected. Choose your billing term from 12 months, 24 months or 36 months. You will notice that discounted pricing of $3.95 a month is applicable only for 3 year term. If you choose shorter billing cycles, you will need to pay higher per month hosting charge. After choosing the hosting plan and term, scroll down to Website Essentials section. Here you can choose any add-on services that you would like to purchase as part of your hosting account. Make sure to review and uncheck those extras that you do not need. Scroll down further to Account Information section. Here you need to enter your name, address and contact information. Make sure you enter all correct details; the email address you provide here will be used to send the receipt and login details. Choose your payment method and enter the relevant details. You could pay using Visa/Master Card/American Express credit cards or PayPal. Underneath the payment information section, you will see “Have a Promo Code?” link. If you have a coupon code, you may click on this link, and enter the required coupon code in the box provided. When you use a link on our website to purchase Hostpapa hosting, there is no need to enter any promo code as the best discount is automatically applied and you get the maximum savings. Next read the Terms & Conditions of Service and check the box to agree with the terms. Double check the Order Summary on right sidebar and click on the “Create Account” button. What billing cycles does Hostpapa offer? You have the option to choose from 1-year (12 months), 2-year (24 months) or 3-year (36 months) billing contract. Higher discounts are offered for longer billing terms, so it is best to opt for 36 months contract as it allows maximum savings on cost of hosting. Hostpapa does not offer any monthly billing cycle. The least you can choose is 12 months contract. What payment methods can I use for purchasing Host papa hosting? The accepted methods of payment include PayPal and Credit Cards – Visa, Master Card and American Express. If you want to use any other card (e.g. 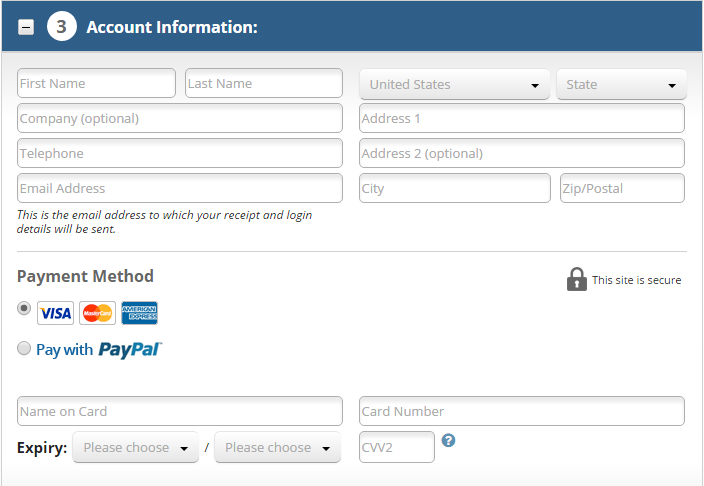 Discover), you may use it on PayPal to make the payment. Hostpapa does not accept payment through cheques or money orders. Does Hostpapa accept payment by PayPal? Yes, Hostpapa accepts payment through PayPal. When using PayPal, remember that Host Papa will not activate your account until PayPal notifies them that the payment is complete, so ensure that you have funds in your PayPal account for faster account set up. Is the renewal price higher than the initial price that I pay? Hostpapa offers introductory prices to new customers, so the cost of hosting is significantly reduced for the initial billing term. At the time of renewal, you are required to pay the full price of hosting, so you will need to shell out more money than the first invoice. You can avail the best discounts by choosing longer billing cycle for the initial term. As part of shared web hosting plans, HostPapa offers a free domain registration for 1 year of subscription. After 1st year, you will be charged at rate of $14.99 per year as domain registration cost. If you wish to use an existing domain name with Hostpapa, you have 2 choices. You may either transfer it to Hostpapa, in which case you can take opportunity of their first year free domain registration promotion. Or if you wish to keep the domain at your current registrar, you may simply set its nameservers to Hostpapa. Does Hostpapa charge any setup fees? No, Hostpapa does not charge any set up fee for new hosting accounts. Does Hostpapa offer a money back guarantee? Yes, Hostpapa hosting comes with a 30 day money back guarantee. You may cancel your subscription within the first 30 days of purchase to be eligible for a full refund. The refund amount is calculated by subtracting any fee related to third-party services, (like SSL or Google Apps etc.) domain registration charges or domain transfer fee. After the payment transfer is complete, account set up is instantaneous and you will receive an email with account and login information within minutes. Does Hostpapa offer Website Transfer Service? Hostpapa does not offer a Website Transfer Service, but they assist you in all ways for a smooth and seamless transfer. The support center includes detailed video tutorials and step-by-step instructions to transfer domain and website from other web hosts. Also they offer 30 minutes, one-to-one training sessions to all new customers. What is Domain Privacy? Does Hostpapa offer this service? When you register a domain name, you provide contact information (like, name, address, email, phone etc.) according to ICANN rules. This contact information attached to your domain is publicly available to everyone through WHOIS listings (which is a searchable database of domain name). Unfortunately it could be unscrupulously used by hackers, spammers or marketers. Domain Privacy service makes this contact information invisible for public access, instead displaying your domain registrar company information. Thus it shields you from spam or unwanted solicitations. Hostpapa offers domain privacy for a small yearly surcharge (currently $8.99 a year). What is SiteLock Website Protection service offered by Hostpapa? SiteLock is a third-party website security tool that continually scans your website for any virus, malware and other vulnerabilities and security issues like, SQL injections, cross-site scripting etc. and sends notifications in events of some suspicious activity. It also includes tools that help to remove malware and clean your website. This keeps your website and application protected from spammers & hackers. You can also include a SiteLock Security seal on your website to increase customer confidence and establish trustworthiness of your business. 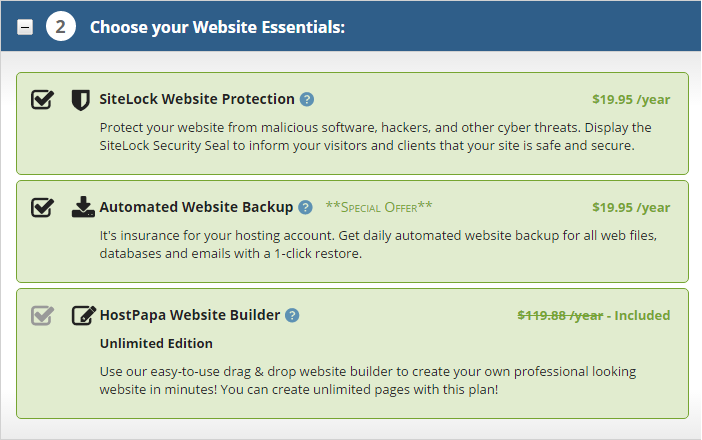 If you purchase Hostpapa Business Pro plan, you get access to SiteLock Basic for free. In other two plans – Starter and Business, SiteLock security is available as a payable extra for $19.95 a year. What is automated website backup service offered by Hostpapa? With Hostpapa automated website backup service, you will get automatic daily backups of your website files, databases and emails. These backup copies are generally stored at a different server location for enhanced security. You also get the ability to restore any backup copy from the last 7 versions with a single click. This service is offered free for customers of Business Pro plan. If you opt for this service with Starter or Business plan subscription, you will be charged extra $19.95 a year.